Many plants, especially herbs, are very invasive and will spread and quickly take over your garden. 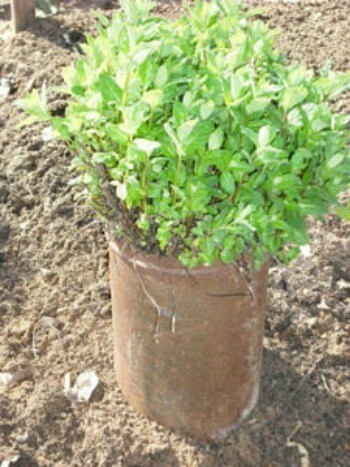 To prevent this, place the plant, like this spearmint, in a container. This mint is planted inside an old ice cream maker. I have a beautiful plant and don't have to worry about it taking over! Okay, now I'm gonna have to plant some mint. I miss having it around, as my mom always had some in a planter by our back porch. Thanks for the tip, from a fellow Louisianian (I'm from Walker). Make sure that it doesn't go to seed, like i did. Mint has very tiny seeds. Mine went to seed when I planted it like this, and I missed some of the seeding tops. The next season I had mint plants everywhere; I could have just planted the mint in the garden. Over a decade later, and I'm still pulling mint up by the handful several times a year. I've gone over my entire garden, digging everything up inch-by-inch, three times. Every spring, it's still full of mint plants. If you miss just a tiny piece of root, you get a new plant. While I love mint, I wish that I never brought it home. You are right! Mint spreads like crazy! I like it though when I cut the grass & the smell of mint is all around me. Isn't that something, if we wanted the plant to self seed and grow all over it wouldn't? I have a perennial poppy that for 4 yrs. never blossomed. Then last yr. it did. It still is one little plant. I'm surprised too because those seeds are tiny, tiny. You'd think they would spread all over too but haven't. Dill is another one you have to watch. It spreds all over from the seeds.